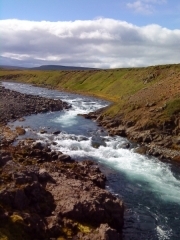 Fly fishing in Iceland is the aspiration of many fly fishers the world over. It is held by many an experienced fisherman to be the most exquisite and technical of all Atlantic salmon fly fishing - a test of skill and application. The gin-clear water and use of floating lines with often extremely small flies, typifies what Icelandic fishing is noted for. While some rivers are suited to double-handed rods, other rivers are intimate, requiring the use of a single-hander and a degree of stealth. While Iceland can provide the challenge that accomplished fishers may be looking for, for those with less experience, it is a breathtaking fishing destination with usually more opportunities for success than on waters closer to home. Unusually for many destinations, Iceland can offer a rod sharing option. This is ideal for those wishing to share the costs of a rod, or perhaps for a husband and wife team. To reduce crowding in the vehicle and to ensure that you get the most from the fishing, we highly recommend having a single guide for those choosing to share rods. The season is squeezed into the short Icelandic summer and is, broadly speaking, late June to Septmber. Typically, the day is split into two six-hour fishing sessions. Iceland is easily accessible with direct and competitively priced flights from London. Schedules are such that you may well leave the UK and be fishing that same evening and similarly may fish a morning session before flying home in the evening. It is an ideal long weekend salmon fishing venue. To prevent the spread of disease and parasites, the Icelandic authorities require fishing tackle brought into the country to be disinfected. Fishermen will be asked to present a Disinfection Certificate on arrival. Tackle Disinfection Services are authorised to disinfect tackle and provide a Disinfection Certificate. For further details email info@tackledisinfection.com or http://www.tackledisinfection.com/.